1960s Glamour icon Audrey Hepburn in THAT classic LBD! Ever since Audrey Hepburn wore THAT Chanel LBD in the classic 1961 film Breakfast at Tiffanys, it has remained a staple must have for every woman's wardrobe. What makes the LBD so special? Since it's creation, women from all backgrounds have had one hanging in their wardrobes. It's the go-to dress for any occasion, it's super chic, elegant and beautifully slimming on the figure. 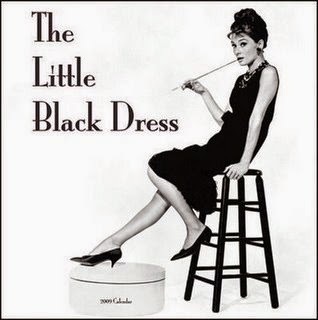 Catwalk and high street designers have perfected the different variations of the LBD design so every woman can wear one and channel their inner Audrey!. So what jewellery is best? This festive season the fashion is all about drama, drama and more drama!. The catwalks were full of rich autumnal colours complemented by large embellishments emphasising the neck and waist. One of the main reasons we love the LBD is because it's the most versatile garment there is, you can dress it up or down depending on the occasion. Costume jewellery has also made a huge comeback this year and we have many statement pieces in store that would be the perfect accompaniment to your party look. Why not pop into our store and see if we can team you up with your perfect piece of jewellery!